* "From" Price is based on highest quantity shown. 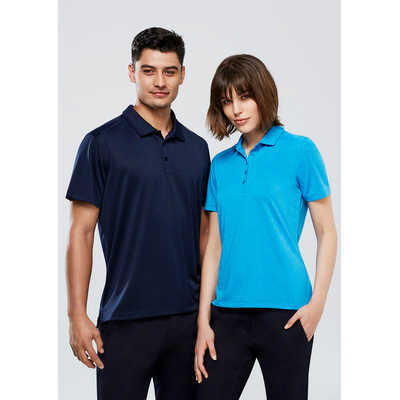 Sizes: | XS - 3XL, 5XL Size Guide | Fabric: | 100% BIZ COOL Cotton-feel Micro Polyester 160 GSM UPF rating - Good | Features: | No-fuss anti-shrink, anti-fade Fabric: has a cotton-like feel that keeps you cool and dry Heathered marle pattern adds a subtle point of difference Flat-locked shoulder seams for mobile comfort Neatly designed self-Fabric: collar & placket Mens style includes loose pocket. Product Materials: Polyester. Colours: White | Black | Red | Silver. Colours: Electric Blue | Navy | Charcoal | Teal | Cyan | Lime | Solid Black. Product Sizes: XS | S | M | L | XL | 2XL | 3XL | 5XL.